Labradorite, which is derived from "red-hot" molten material called magma, is one of several phases (varieties) of the mineral plagioclase. All these phases have the same general formula (Ca, Na)(Al,Si)3O8. As the magma cools, a solid-solution series of different phases/varieties of plagioclase crystallize out sequentially, with varying amounts of Ca (calcium) and Na (sodium). The calcium and sodium ions mix in a continuous series with their ratio varying from 100% calcium and 0% of sodium, to the extreme opposite. Labradorite consists of 50 to 70% calcium and occurs as blocky to lath-shaped crystals in calcium-rich igneous (magma-derived) rocks, such as basalt, gabbro, and anorthosites. Labradorite is relatively uncommon, but some rocks consist almost entirely of this mineral. 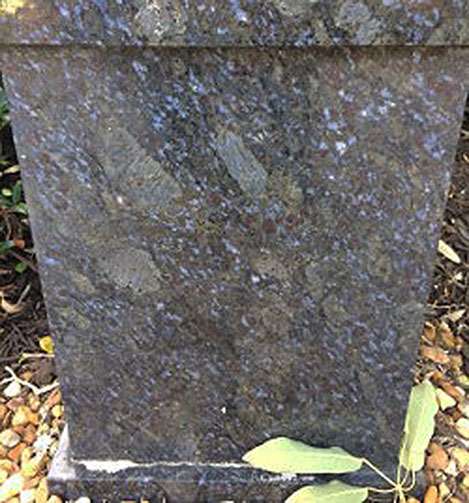 A 3 foot-high slab of labradorite used as a pedestal for a monument. You can see how some of the crystals are large and lath-shaped. The bluish-iridescence of this mineral is especially evident in the upper part of the picture. One of the most memorable features of labradorite is its iridescent play of colors, which results from this mineral’s peculiar reflection of light. The reflection is caused by internal fractures that reflect light back and forth. Polished piece (width 5.7 cm, 2.5 in.) of labradorite showing its iridescence. To see it, one must tilt the specimen at just the right angle to the prevailing light; a few degrees too much or too little tilt, and the iridescence disappears. Labradorite-bearing rocks occur worldwide, especially in Labrador, Canada (where this mineral inherited its name) and in Norway. 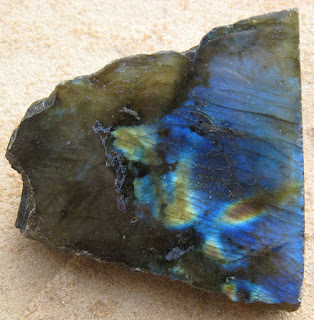 Labradorite is used for making floor tiles, kitchen counter-tops, tables, and benches. It is also a popular gemstone. For more information about the solid-solution series that is associated with the formation of plagioclase, please Google the term "Bowens Reaction Series." Note: I used to include links to topics covered in my posts, but recent changes in Google Posts now deactivate these links when posts go to the "Archive" file.